Why the Art Of Moulding for Door Replacement? 3 for the price of 1. That what you get with our door replacement offer. 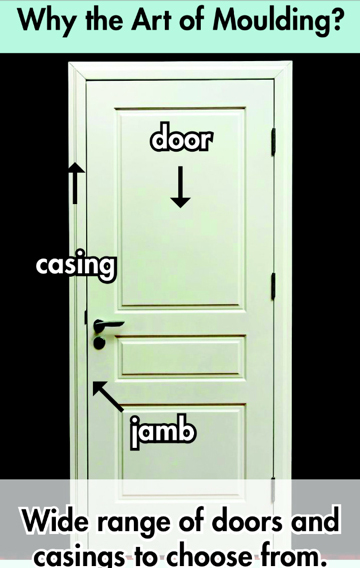 We replace your old door with a new interior door, jamb and casing (moulding)! We use number one wood product for our door jambs while other contractors use MDF product. Plus, we paint the door, jamb and casing. Most contractors or companies provide the installation of the door only. The jamb and casing are additional and the painting of these items generally requires another contractor to complete. Art Of Moulding does it all! We paint the doors and moulding in our shop using air spray equipment that seamlessly paints the door, jamb and casing at the same time ensuring a perfect color match. Other contractors or companies may paint the door on the premises creating an undue mess at your home and their color matches are not always done to the customer's satisfaction. Our team of professionals will assist you in selecting the best door design and case moulding for your home. Your new doors will open vistas of beauty and pleasure for years to come. Reasonable prices for every budget and every home at an affordable price. Click here to see our samples of door replacements.